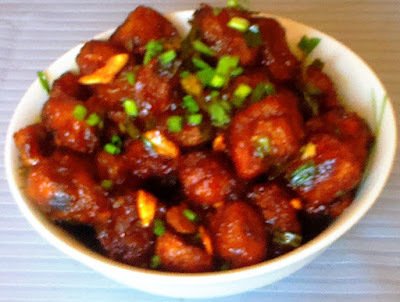 Mix together the Soya chunks with 1 pinch of salt and garlic and ginger paste. Heat the oil, add the onions and stir-fry over high heat till a little brown. Add the green chillies and stir a few times, add the remaindered salt, soya sauce, tomato ketchup, vinegar and the Soya chunks. Stir-fry over high heat for a 2-3 minute. Now soya Chunk chiily is ready. Garnish with some chopped green onions and serve hot.